When it comes to colour research actual airframe artifacts with original paint still adhering to them are seductive, like colour photographs. They represent a tangible link to the original aircraft - a tangible link to the past - and can be held in the hand and viewed at different angles and under different light. It is wholly understandable that they play such a significant part in our perception of what these famous aircraft really looked like. "When gray is mixed with little yellow, it turns to light greenish gray. This is a very simple truth. The same thing is now being discussed about the Luftwaffe Sky like RLM76. What I said is very simple. 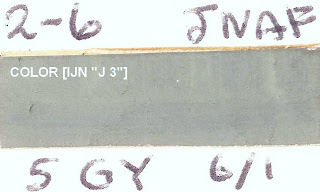 J3 was the color defined as an official surface color. I do not deny any sample of khaki or hairyoku or ameiro. I think there were those kinds of colors even in '42 or '43. What I said is there could have been many kinds of gray because that gray was changing very rapidly. There is no official document to confirm it but some documents imply that paint was improved mid '43. This might support (the idea) that gray on (A6)M5 samples is much more like gray than those on (A6)M2, (A6)M3 because the paint was more durable against color changing. As I said, this is not confirmed. 1. There were a variety of grays including Hairyoku, Khaki, ameiro and etc. No doubt about it. 2. There are two possibilities. a) Different color was used for each sample. a) There is no statement found so far that any other color than J3 was used. b) The problem of changing color of clear paint (binder) is reported. 4. Right now, the possibility of color change is slightly stronger than that of using different color. I admit we cannot reach a firm conclusion. However, we can not discuss color based only on samples and color chips any more. Before, when people said about color change, there were not enough supporting documents but today, there are. We cannot rule out the possibility of color change. Important thing is that many researchers admit there could be many kinds of colors. They are now try to find out why it happened. If some one picks up one sample and says it is Tsuchi-iro because it matches the color chip in the standard, unfortunately it will not be convincing at all to those Japanese researchers today." Even the most advanced polyurethane paints of today are seldom guaranteed to a colour shift of less than a Delta-E value of 5 over a 40 year period. To put that into perspective it represents approximately the difference between Thorpe's N9 and FS 34201 at 5.40. The latter value has often been cited as a close match to early Zero paint samples. The plate above shows these two colours together. It is quite possible therefore that a 65 year old paint sample that is now matched to FS 34201 originally looked more like grey. We will look at the subject of grey and more specifically J3 in a subsequent post. The wartime paints were far less advanced than the modern paints and have endured 65-70 years of UV exposure, chemical change and/or thermal ageing. Nitrocellulose paints of this era would typically exhibit significant colour shift and degradation, even when carefully preserved from UV exposure, over a period of only 5-10 years. Leading paint technology experts believe that after 50 years the pigment residues, even on these carefully preserved examples, would be "useless for attempting to discern their original colours". The promotion of the current appearance of these artifacts as literal evidence for the paint colours in use in 1941-45, without allowing for or mentioning colour shift and degradation and to the exclusion of all other evidence is a flawed and misleading approach. From a purely historical research perspective it could be viewed as irresponsible. Beyond the current appearance of the paint samples but related to it is the colour science that determines how the paint surface is measured and matched using recognised colour standards. This seems quite straightforward but it is not. Some colour occupies a subtle colour space and only very small shifts are required to result in a very different appearance to the surface. Recently a claim was made that the current colour of a particular artifact matched the appearance of the undersurface colour on an aircraft of the same type seen in a wartime colour photograph (in other words the colour photograph corroborated the current appearance of the colour in the artifact). However, much to the annoyance of the claimant it was possible to demonstrate using colour science that his claim was poppycock. The colour in the photograph did not match, even remotely closely, the extant sample. Of course the claimant then pronounced that it was impossible to measure colour accurately from a colour photograph, etc., without appearing to realise that such huff and puff undermined his own original claim. Subsequently information was received indicating that the same extant paint sample has exhibited considerable ambering or "browning" over recent years, attested to by museum staff and other interested observers. The colour claimed was Munsell 7.5 Y 5/2 and the two plates above show the actual results of the photographic analysis of the "corroborating" colour, the closest Munsell and FS equivalent values. We are going to get technical about paint degradation and colour shift in the second part of this article, to illustrate exactly why and how it happens. To hold up a 65 year old paint sample and ignore degradation and colour shift is to omit a significant research factor in understanding the original colour. This article is the output from factual and original research into the subject of paint ageing and deterioration made in consultation with qualified and recognised experts in this field. It should be read in the context of previous postings in the Olive Grey series. despite no comments has been made so far I'm positive that your hard work is highly appreciated by some. We may never know the full truth but your scientific and analytical approach will ultimately help us get some fact right. If I recall correctly you said something like "it's better to have some facts than none". 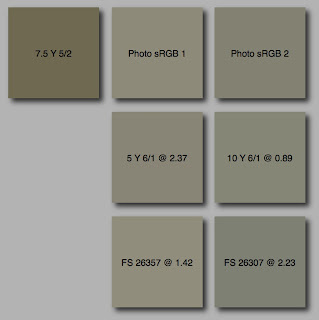 Interestingly we might end up with just "good old light gray" from decades ago. But apparently it will never be just the pure gray, at least for early Zero models. Please keep up with this amazing work. P.S. Have you received my e-mails? One recent, earlier from several weeks ago. Thanks for your kind comments. I'm never concerned by the absence of comments. Checking the views vs posts at most forums (fora?) reveals that 80% + of the online modelling community are "lurkers". And I don't blame them! Of the remaining 20% I reckon 10% post and share information in response to questions and 10% spend their time challenging it. That 20% move flexibly between those two stereotypes too! I have been having a lot of email issues. My ISP suddenly decided to broaden the parameters of what it considered to be "spam" and for a period of several weeks many genuine messages were dumped in the spam folder. Unfortunately by the time I twigged this many had been deleted. The situation has improved now but I still have to check the spam folder at the ISP site to retrieve some emails.